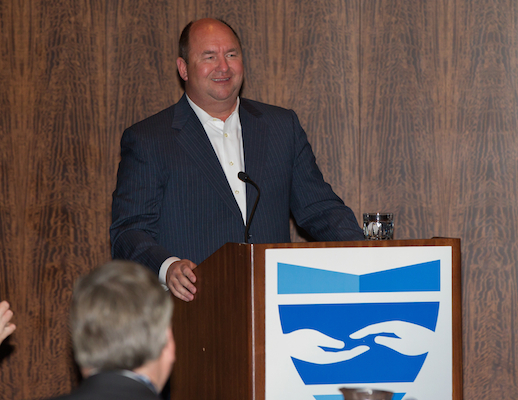 WEST DES MOINES, Iowa — Although Randy Edeker is a relative newcomer to the National Association of Chain Drug Stores board of directors, he has already had an impact on the organization, one that will increase significantly this week when he becomes NACDS chairman. Edeker, as chairman, president and chief executive officer of food/drug combination store operator Hy-Vee Inc., is only the third executive from a company whose primary business is grocery retailing to lead NACDS. That has not prevented him from grasping the importance of health and wellness programs to consumers, as well as the growing role of community pharmacy in the nation’s health care system. Edeker’s insights about retailing are based on extensive experience. He joined Hy-Vee in 1981 as a part-time employee at a store in Chariton, Iowa, and worked his way up through the ranks. During his 34 years at the company, Edeker has held store and regional positions in four of the eight Midwestern states where the company operates, consistently winning recognition from his peers, and served as vice president of marketing and senior vice president of retail operations. He was named executive vice president and chief operating officer in 2008, president a year later, and chairman and CEO in 2012. He joined the NACDS board a year later. During the course of his career, Hy-Vee emerged as an innovator in pharmacy, health and wellness. In addition to offering expert pharmacy service and an extensive selection of over-the-counter health care products, the company is a pioneer in staffing its store with nutritionists, who work closely with pharmacists to support the well-being of customers. CDR: Assess the state of the chain pharmacy business. EDEKER: From Hy-Vee’s perspective, the pharmacy business has never been more important than it is right now. Not only is pharmacy an eighth of our total business, but health and wellness has touched every aspect of our business; it affects everything that we do. And that was the catalyst for me to get involved with NACDS. NACDS provides a great opportunity for Hy-Vee to come together with other like-minded folks to focus on areas that will be beneficial for all of us, and it brings a strength in numbers to help us move forward. In addition the NACDS Foundation conducts research that will guide public health decisions. CDR: What priorities will you have as you begin your year as chairman? EDEKER: Among the long list of issues that NACDS needs to work on, a huge focus should be on access to care. The current situation of narrow pharmacy networks, which limits care, especially in rural and urban areas, has to be addressed. NACDS has worked on this, and there needs to be some change from a regulatory standpoint. That’s crucial for many of us. The scope of pharmacy practice also needs to be expanded. Our pharmacists are incredibly intelligent people with the ability and the training to do more in their pharmacies, and yet they are not able to do so. The public sentiment is there for expanding the scope of pharmacy practice, and from a legislative standpoint the need is definitely there. Expanding the scope of practice goes hand in hand with expanding access to health care in rural and urban areas to ensure that care can be easily provided to a customer. Obviously, you’re not going to go to see your pharmacist for everything that’s wrong with you; care for patients needs to be provided in conjunction with the medical community. But the delivery of accessible health care to people as they try to manage their own health is going to be a big ­opportunity. CDR: Do you find that your customers are comfortable coming to your stores for an expanded array of services? EDEKER: Hy-Vee has provided pharmacy services for many years, and our customers are very comfortable coming to our pharmacists with questions. According to surveys, pharmacists have been among the top five most trusted health care professionals for years, nurses and doctors included. Hy-Vee pharmacists are used to getting a lot of questions, and I think customers do trust them. Coupled with our pharmacists’ knowledge is that of our 224 dietitians, to whom customers can turn daily for such nutritional advice as help with dietary needs, understanding products, understanding labeling, and understanding what they should and should not be eating. Our customers would be very comfortable with expanded clinical services in the store and an expanded scope of pharmacy practice. The biggest driver of customer inquiries now is the fact that people are busy. Customers will take advantage of the greater health care access that we provide because it’s ­convenient for them. CDR: As a food/drug combination store retailer, do you have a different approach to NACDS than you might as solely a drug store operator? EDEKER: Possibly. Retail is evolving from all directions; the drug side of the business is evolving toward the supermarket side, and maybe we’re evolving toward the health care side a little bit. Some of the big drug chains are increasing their offering of prepared food, wine and spirits, so there’s really a full line of grocery items in a lot of those stores. Meanwhile, we’re heading in the health care direction. Supermarkets and drug chains share many of the same objectives, but we arrive at them from different directions. CDR: What steps is Hy-Vee taking to maximize the benefit of the NACDS meetings that you and other executives ­attend? EDEKER: Our involvement with NACDS has evolved over time. For years we were content just to send our vice president of pharmacy to attend NACDS events. When I was first asked to join the NACDS board several years ago, I declined, but when I was asked again the following year, I gave the offer greater consideration. I saw that NACDS had become more in tune with Hy-Vee’s needs as they relate to pharmacy and the evolution of health and wellness. After I considered the increased scope of the pharmacy business within our company and the influence that it has on every department, I decided to join the NACDS board in 2013. The following December I was asked to become treasurer, and this year, as a result of a retirement, I’m skipping the vice chairmanship and moving straight to chairman. CDR: You said that pharmacy has an effect on everything that goes on within your stores. Can you elaborate on that a little bit? EDEKER: Pharmacy affects everything that pertains to health and wellness in our stores, and the dietary side of the business is another big influence. We help customers find ways to eat more healthful meals, and we have 190 chefs in our stores to help customers make healthful food taste better. We ensure that natural, organic, locally grown items are seen as part of our health and wellness offering today. We see pharmacy as being a large part of a complete health and wellness package. 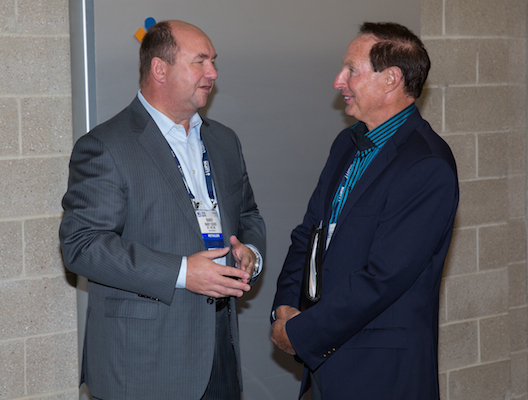 CDR: Based on your involvement with NACDS, what can be done to enhance Total Store Expo and other events? EDEKER: The NACDS events are very well run, very well orchestrated. NACDS does a great job of bringing people together to discuss topics, get issues solved and get business done. It’s not just a meeting that people attend because they need to be seen and have to check the box. At NACDS events stuff happens, decisions get made and people discover new products and innovations. As I walked the floor at last year’s Total Store Expo, I found several items — from natural baby clothing to all kinds of telemedicine-related devices — that we have now implemented. Since Hy-Vee has stores in eight Midwestern states, we look for opportunities for our rural customers, including products related to telemedicine and mobile pharmacy. One indication of how much NACDS has changed since my involvement with the board is that I now will take our chief retail officer, chief merchandising officer and chief marketing officer to Total Store Expo. That has been a bit of a shift in how we do things. CDR: You mentioned telemedicine as an opportunity for Hy-Vee. What can NACDS and the industry as a whole do to help Hy-Vee and other retailers capitalize on emerging opportunities as the health care environment changes? EDEKER: One of the things NACDS can do is make sure that changes in the health care environment are on our radar screens. Through research, NACDS can make sure that retailers understand the trends in our customers’ lifestyles so that we can be positioned properly when customers enter our stores. NACDS can also lead the charge on the regulatory and legislative side of the business, which is becoming a bigger and bigger component. The association can help retailers navigate those waters and can be the catalyst for educating legislators and others in national and state government about pharmacy. Obviously, NACDS’ activities have to be beneficial for our customers, our patients and our business, but the association is the right entity for bringing government, patients and retailers together. CDR: You mentioned communication in Washington and in the states. What are the key points that you and your NACDS colleagues hope to get across when you meet with members of Congress and other officials on RxImpact Day [March 25-March 26]? EDEKER: Individuals may have differing views about how health care should be delivered, but our general view at NACDS is that we need to make sure that our customers have access to what they need. They don’t always have that access, and they don’t always have it at the best price. A retired congressman once phoned me to ask why the co-payment for a prescription cost $15 at one pharmacy and the co-pay for the same prescription cost $3 at another. Retailers are constantly challenged by how co-payments are structured today. Access to health care is a key point that I will be making on RxImpact Day, and the event provides a great opportunity for face-to-face interaction. People need to figure out how retailers are going to take care of patients when they walk in our stores. CDR: What do you think of the Affordable Care Act as it stands now? It was supposed to address some of the issues you are passionate about. I am concerned that not every patient has the coverage that they need or the care that they need as a result of the law. That’s a frustration. But we as an industry and as a company can move forward by keeping in mind that we are still providing health care to our customers at the point of access. When customers enter our doors, they should have access to affordable care, although obviously not for severe health problems. CDR: Is Hy-Vee participating with the emerging care models, accountable care organizations, etc., that have arisen as a result of the ACA? EDEKER: We have partnered with several health care systems throughout our territory — the Mayo Clinic in Minnesota, the University of Missouri – Columbia, Creighton University in Nebraska and the University of Iowa. We’ve partnered with Mercy Health Care and UnityPoint Health here in Des Moines to drive health care in the right direction. We have worked with Wellmark Blue Cross Blue Shield to launch an affordable care option in Iowa and South Dakota that involves our dietitians and our pharmacies. What we’ve done to help drive health care and make it more affordable keeps us part of the solution, moving forward. CDR: Is it too early to see any results from those ­partnerships? EDEKER: From the clinical side, the results have been phenomenal, and they have been achieved pretty quickly. The insurance offering that we collaborated on with Wellmark and UnityPoint has only been out one year and has already done surprisingly well. And the offering ties in well with our dietitians. The dietitians have been a great access point for us with health care systems. We’re able to offer that service in conjunction with what health care systems already offer, so that keeps us tied in. And we have found that our dietitians are thrilled to be on the front lines of nutrition and health care, as opposed to being on the rear lines, where dietitians traditionally have been. Formerly, patients would see a dietitian only if they had suffered a heart attack or were diabetic. In certain rural areas in our trade territory, one of our dietitians will often have to share a few small stores. In those small towns that one dietitian will often be the only one that customers will ever have access to. CDR: You mentioned Total Store Expo. What more can NACDS do to help its members address the front end? EDEKER: NACDS already does a good job of creating a collaborative atmosphere. Face-to-face time is what we all want — manufacturers and suppliers as well as retailers. We want time to see what’s on the agenda for both retailers and suppliers, so that we can come together at points that make sense. Another retailer may work with a supplier according to a completely different business model from the one Hy-Vee uses, but NACDS provides the time for sorting these things out, so that we’re all on the right path. What I love about Total Store Expo is the table time. I love that there are a dozen tables where my buyers can sit down and meet people whom we might never have met before. A full page in this year’s Hy-Vee corporate ad is devoted to items that we found at TSE last year and hadn’t known about before. The more that NACDS can do to foster collaboration — whether the supplier’s business is related to health care, general merchandise or importing — the better. *Editor’s Note: To read the full interview with Randy Edeker, please see the April 27, 2015, print edition of Chain Drug Review.